ENGLEWOOD — Lavell Hayes and Darius Grant sat on a porch in Englewood early Tuesday morning, just across the street from where their friend, April McDaniel, was shot and killed Monday afternoon. A spot of blood soaked through the gauze wrapped around Hayes' left forearm, marking the spot where he said he, too, was shot. Hayes, 16, ripped a Mount Sinai Hospital band from his wrist and tossed it to the ground. He said he did not realize he had been shot until he saw blood running onto his hand. "It started burning," he said. Hayes, McDaniel and a group of friends were hanging out on a porch in the 5700 block of South Sangamon Street about 5 p.m. Monday when four men inside a green SUV pulled up to them, Hayes said. The men asked if anyone sold marijuana and when they said they did not, one man got out of the car and opened fire on the group, Hayes said. Police said McDaniel, 18, was one of five people on the porch who were shot. A bullet struck her in the throat, and she was pronounced dead at Stroger Hospital at 6:38 p.m. Monday. Grant said McDaniel's brother was on the porch with her when shots rang out. "He ran and got her," Grant said. "She died in his arms." Police said four other gunshot victims — ages 15 to 21 years old — were taken to area hospitals after the shooting. A 15-year-old boy was hit in the leg, and an 18-year-old man was shot in the stomach. A 20-year-old man was shot in the left hand and right knee, while a 21-year-old suffered a gunshot wound in the left leg, police said. Police said they had no information about Hayes being shot. He said he didn't go for treatment until later because he didn't realize he was shot until the others had been taken away in ambulances. Grant and Hayes sat on McDaniel's porch Tuesday morning as family members grieved inside the home. Grant said the two were there to offer their support to the family. He said McDaniel was a close friend. "Everybody loved her," he said. Grant said McDaniel wanted to be a singer, and she had a good voice. He said she used to hang out with her brother's friends on the porch. "She'd be out here singing for us," he said. "She'd just up and sing for no reason. Didn't nobody know why." Grant said he didn't know if McDaniel had any favorite artists. "Since she knew she could sing, she'd make up her own" songs, he said. "She sing about food or anything, anything to put a smile on her face." McDaniel's father, Timothy McDaniel, said the teen was a senior and preparing to graduate from Community Youth Development Institute, an alternative high school in Chicago. Timothy McDaniel said he was working when he heard his daughter had been shot. He said he was angry at the "senseless" way she was killed. "My mind's just messed up," he said Tuesday. "To go over there and open fire on a crowd of teenagers ... 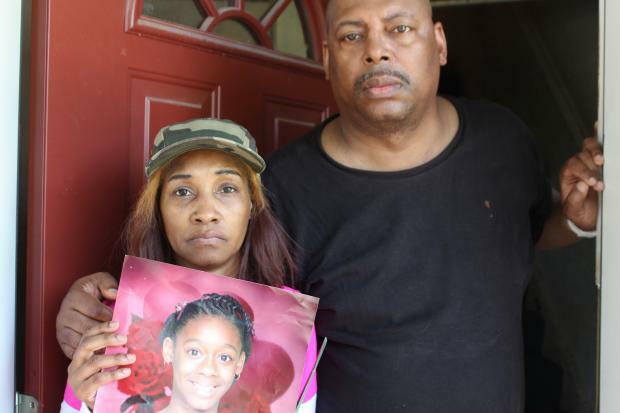 It really didn't make no sense, and my daughter was killed because of it." He stood in the doorway of the family's home with his arm over April McDaniel's mother, Hattie Jackson. Jackson clutched a cell phone that played a video of her daughter singing. "She made this song," Jackson said. It was a remix of a Drake song April McDaniel liked, her father said. Jackson said she was at home when the shots that killed April McDaniel rang out. She said one of her daughters ran to the front window of the home and told her she saw McDaniel fall to the ground. She said she wanted people to know her daughter was a good person who stayed out of trouble. Timothy McDaniel said he had faith police would catch his daughter's killer. April McDaniel and the four others wounded in Englewood were among 12 people shot across the city Monday, authorities said. Hayes said April McDaniel and other friends were hanging out on the porch Monday evening "just goofing around" as usual. Neighbors said a local group named "No Love" had gotten into some confrontations with another group in the area. Hayes and Grant believe the shooters may have mistaken April McDaniel and the others on the porch as belonging to the group. Despite the hole in his arm, Hayes said he was feeling good Tuesday, although he said he didn't consider himself lucky after Monday's shooting. "I wouldn't say that," he said. When asked if it was the first time a friend had been gunned down, Grant looked down and gently laughed at the question. "This [is] Chicago," he said.